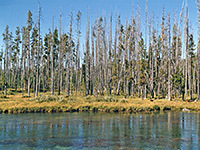 Unlike most rivers in southeast Idaho, Henrys Fork of the Snake River is not fed directly from streams draining the Teton and Yellowstone mountains, but instead originates from Big Springs, a first magnitude spring 6 miles from the continental divide in the Targhee National Forest. 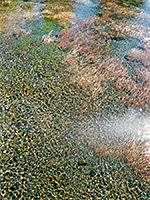 So large are the springs (producing 120 million gallons of 52°F water per day; in the top 40 on earth by volume) that they create a full size river 150 feet wide just a little way downstream. The springs are the only first magnitude source in the US to originate from rhyolite rocks, and their clear waters are home to huge rainbow trout, protected from fishing for 5 miles downstream, until the river reaches Island Park Reservoir. The area around the springs is managed by the USFS; facilities include parking, camping, trails and a picnic area, and the place is quite popular, especially in summer. 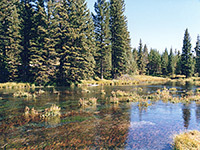 The source of the Henrys Fork River may be visited by the 9 mile Big Springs Loop Road, starting and ending at junctions with US 20, and crossing flat, partly wooded land north and south of the river. The middle of the loop crosses the river immediately below the springs, and passes two parking areas at either side, start point of two short paths along the edge of the springs and a longer (half mile) nature trail that follows the south bank of the river. One other point of interest is Johnny Sack Cabin, a historic wooden dwelling overlooking the east edge of the springs, backing on to a steep hillside that rises 500 feet over a short distance. The cabin was built in 1929, added to the National Register of Historic Places in 1979, and the interior may be toured between June and September.